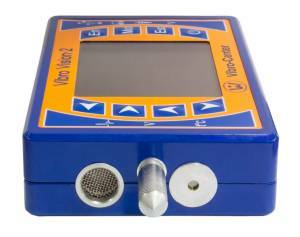 a vibration data collector with advanced functions of roller bearings diagnostics. The device is used for measuring rotating equipment vibration, as well as for effective equipment condition diagnostics "on-site". Why do you need this device? The device measures rotating equipment vibrations. Vibration is a very good indicator of the equipment condition. The physical nature of vibration is clear. The warning and alarm values for vibration are standardized. The device can quickly assess the condition of a number of machines (vibrometer mode). If the measurements are carried out regularly then it is possible to predict the changes in the machine condition and plan ahead the repair. This allows concentrating on the real problem places and avoiding extra scheduled repairs. For more information see "Aurora-2000" software. If there is a need, you can look further into the causes of vibration (vibration analyzer mode). The methods of defect diagnostics by vibration are well known. "Atlant" software by Vibro-Center includes automatic diagnosis of the machine defects. The measurements can be carried out by the staff with little experience in vibration diagnostics (vibration measurement by the route). 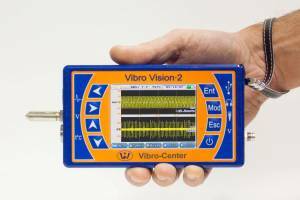 Additional sensors for roller bearing diagnostics are built into "Vibro Vision- 2" vibration analyzer. We have also added the function of listening to the vibrations "by ear" for the vibration diagnosticians of "the old school". "Vibro Vision-2" is a vibrometer, it can measure the vibration RMS value (as well as amplitude, peak-to-peak) and monitor the machine condition. "Vibro Vision-2" has got two vibration sensors, one of them is a built-in sensor for fast measurements, and the other is an external sensor for the hard to reach places. "Vibro Vision-2" has got an ultrasonic microphone and a temperature sensor for assessing the defects of roller bearings by different methods: the envelope spectrum, Kurtosis, SPM. "Vibro Vision-2" is cased in metal; it is a robust but compact and lightweight device which goes readily into the pocket. 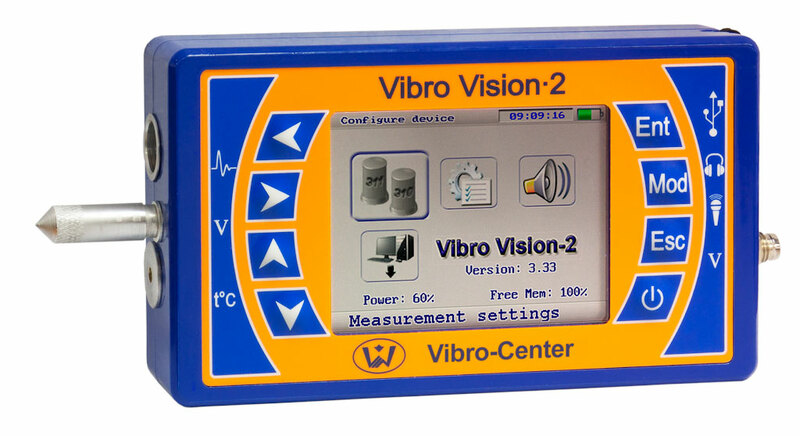 "Vibro Vision-2" has got a large memory capacity, is can store, display and download to PC thousands of measurements via USB. 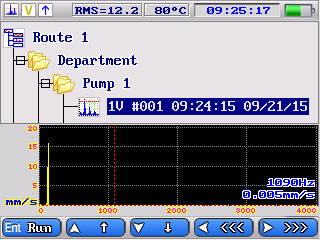 In "Vibro Vision-2" there is a function of measuring by the route. Make the equipment list on PC and carry out the measurements according to the list quickly and easily. "Vibro Vision-2" is charged via USB from PC or the power supply. One charge is enough for one working shift. 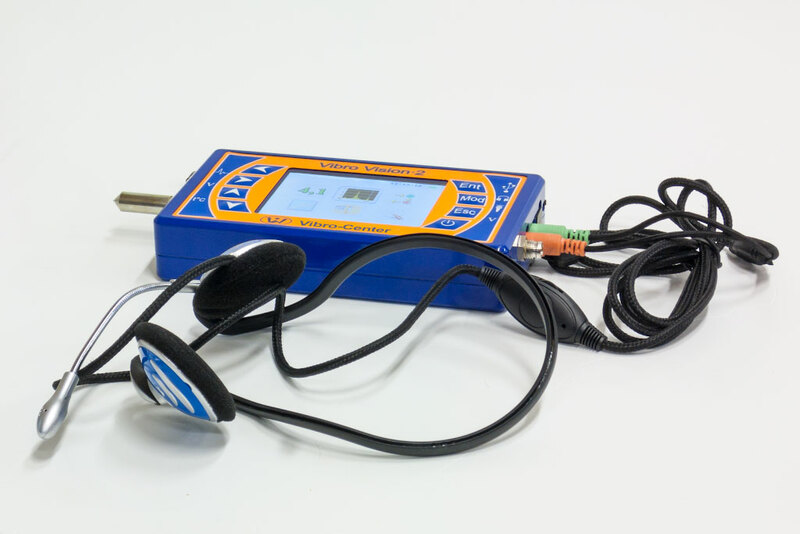 In "Vibro Vision-2" there is a function of listening to the vibration (the headset is supplied together with the device) and recording the voice comments for the sake of recalling the details. The updated firmware, as well as "Atlant" and "Aurora-2000" software for data storing and processing are free available on our website. The device can measure the vibration waveforms and spectrums in the standard range of 10-1000 Hz or in the range specified by the User. Acceleration, velocity, displacement and amplitude envelope are measured simultaneously. It is easy to switch from one parameter to another in the screen. The cursor with harmonics is displayed on the spectrum graph, and the bearing frequencies are displayed on the amplitude envelope graph. 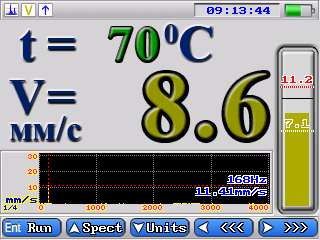 In the vibrometer mode the device measures the vibration of the unit; the vibration value is displayed as a single number. This can be RMS, or acceleration amplitude, or peak-to-peak displacement. 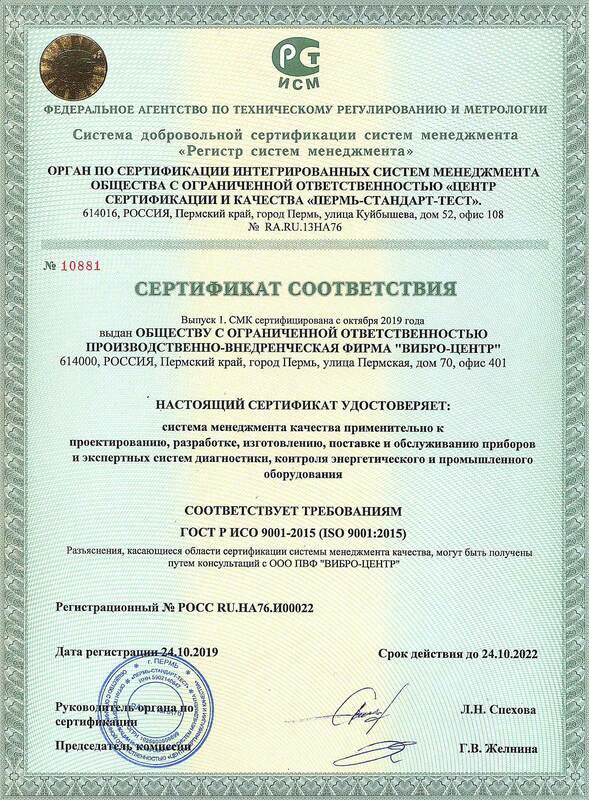 For the equipment condition assessment the maximum measured vibration value is compared to the normal vibration values which are specified in the equipment certificate or standardizing documents. 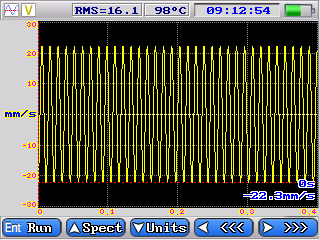 The alarm threshold value is set in velocity RMS and it has standard sequence: 1.8; 2.5; 4.5; 7.1; 11.2 etc. mm / sec. This value is changed from the keyboard in the column in the right part of the screen. Then the color of the number and the column will be matching of the condition of the unit. "Vibro Vision-2" device has got an in-built vibration sensor. 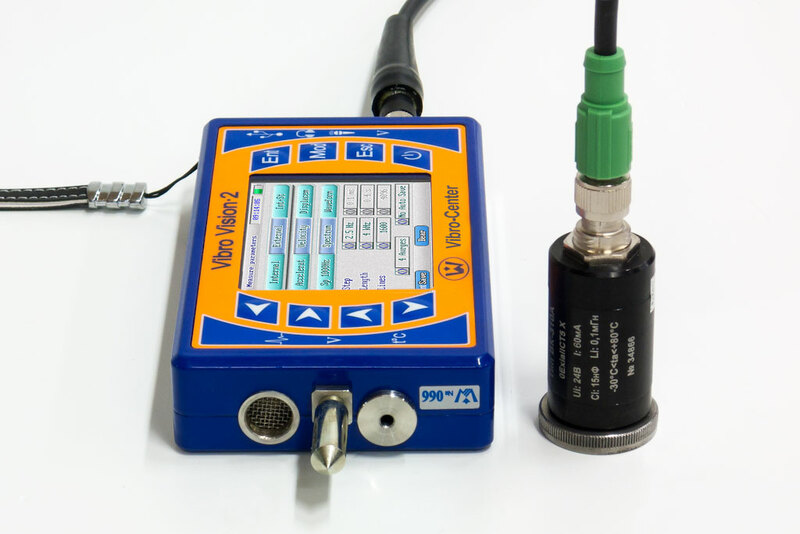 For vibration measurement it is possible to fasten the M5 thread probe, the magnet or the pin to this sensor. The in-built sensor allows quick vibration measurement without any cables. On the back side of the device there is a slot for the external vibration sensor connection. This sensor allows vibration measuring in hard to reach places. The device is supplied with VK-310A sensor. The sensor has got the same M5 thread for installation. Standard cable length is 1.5 meters. The cable can be lengthened by using the optional extension cable. Measuring by the in-built or the external sensors are chosen in the device settings. 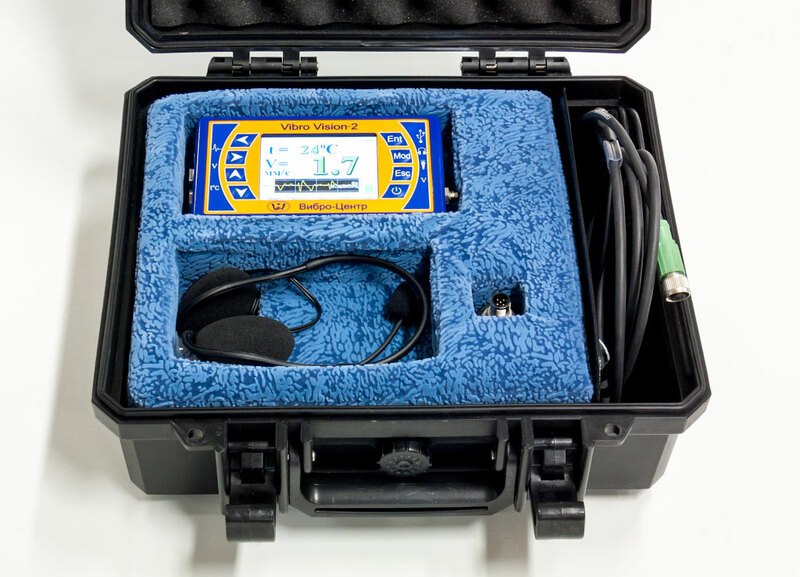 On the front plate of the device there is an ultrasonic microphone (in the left hand part) and an infrared temperature sensor (in the right hand part). It allows remote assessing of roller bearing condition. by RMS values, the peak factor and the Kurtosis of the vibration. The increased temperature indicates the bearing lubrication problems or operational modes problems. The infrared sensor allows distant measuring of the bearing temperature accurate within one degree. The device is cased in metal, it is strong but lightweight (500 gram). The device is small – it goes readily into the pocket. The keyboard is membrane with convex buttons and splash protection. Bright color screen is protected with glass. The USB and the headset connection slots are protected with rubber caps. There is a hand strap in the set. The device has got 256 Mb memory for measurement storage. This allows you to store several thousand of waveforms with the highest resolution available. When you turn off the device measurements are kept. The measurements are easily viewed in the device screen. The interesting places in the graph can be zoomed. You can create a folder for each machine and store all the measurements made on the machine in one and the same place. After all the measurements have been carried out, connect the device to PC via USB 2.0 and upload all the measurements into "Atlant" or "Aurora-2000" software for detailed analysis. Route is a sequence of vibration measurements, created beforehand. The route allows quick vibration measuring in the right order and with the correct parameters. The measurements by the route can be carried out by the staff with little experience in vibration diagnostics. The route is created in "Atlant" software after binding the machine parameters. The route includes the list of the machines, with the measurement points and parameters set for each. Then the route or several routs should be downloaded into the device via USB. While measuring by the route is being carried out "Vibro Vision-2" device prompts the machine and the measurement point, sets the parameters and stores the measurement by itself. It makes the measurements more quick and allows avoiding mistakes. After all the measurements have been carried out , the data is uploaded into "Atlant" software and is automatically sorted by the measurement folders. The device is powered by a 3400 mAh lithium-ion battery. This is quite enough for a full working shift. The device is charged via micro-USB connector from the power supply or from PC. Charging from the power supply takes less than 4 hours. The remaining battery capacity in percents and the charging process is displayed in the screen. recording and later playing back the voice comments on the measurement, for example, when and why the measurement was done. The headset has occipital mount, it can be worn with a hard hat. The cable is reinforced and has a volume control. The firmware updates for "Vibro Vision-2" is free, the latest version is always available on our website (see at the end of this page). This allows efficient correcting of the device shortcomings and adding new features. Updating is done from PC via USB and takes less than a minute. 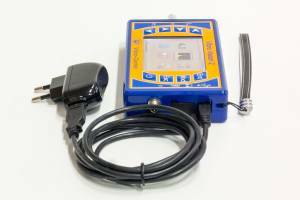 The device is supplied with "Atlant" software for measurement storing and spectral diagnostics and "Aurora-2000" software for equipment maintenance planning. The software is also free, download fresh versions from our website. The software includes the tools for automatic defect diagnosis by vibration, which assists efficient defect diagnostics as well as staff training. At the customer's request the external sensor cable length can be changed.